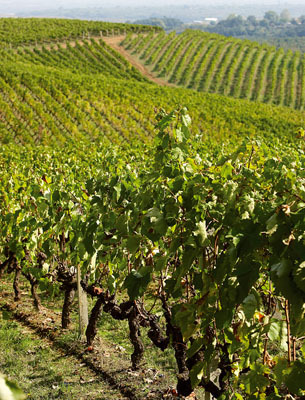 Greeks are said to be the first to produce wine, with traces found on the Island of Crete 4,000 years ago. In ancient times, it was a beverage that people drank every day. Wine was significant as a lucrative trading commodity. The Greeks introduced winemaking to Italy, with many Italian grapes having Greek roots such as Malvasia and Moscato, just to name a few. Later the Greeks brought wine making to France, Spain, and as far away as parts of Asia. Wine was such an intrinsic part of Greek culture it appears in Greek Mythology. The son of Zeus, Dionysus, known as the God of wine (Bacchus to the Romans), was believed to have introduced the grapevine and taught the secrets of its cultivation and fermentation. There were many festivals in celebration of Dionysus. The tradition of festivals still holds in Greece, and here in the US they are called Glendi’s (good times) associated with Greek Orthodox churches, but open to the public. All of them celebrate with music, food and most with wine. Retsina, the national drink of Greece, along with Ouzo, is white or rose’, touched with pine resin, and has a sweet, sappy taste – a unique flavor. Many traditional Greek tavernas make their own, stored in barrels, and it’s good. While many Americans have not acquired the needed taste for enjoying Retsina, we can now find many fine Greek wines without this resin flavor. Just as Greek cuisine is now being appreciated, so are Greek wines. 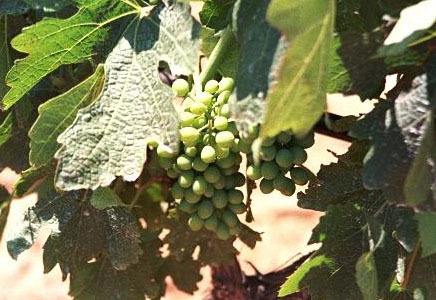 Greece has always been blessed with an excellent climate for growing grapes. Today through investment in modern technology and wine maker training at some of the finest schools in the world, Greece is producing fine wines, from their indigenous grapes, that have been recognized with International awards. 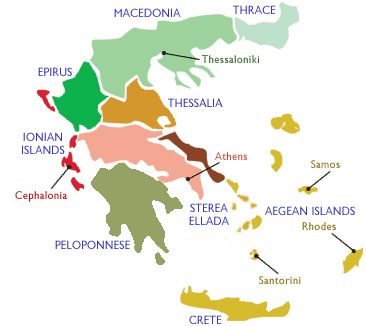 While there are seven wine growing regions in Greece and 300 indigenous grape species, the primary regions of export are: Macedonia, northern mountainous Greece, with its cooler and even growing climate; Nemea a region on the Peloponnese, southwest of Athens; and the Island Santorini (site of the legendary Atlantis). The white wines rival those produced in other regions throughout the world, and the red wines produced from, or blended with, their indigenous grapes deliver a taste that you can find no where else. The sublime Vin Santo sweet wines from Santorini are legendary. White - Aidani, Assyrtico, Athiri, Dafni, Debina, Lagorthi, Malagousia, Monemvasia, Moschofilero, Muscat, Robola, Roditis, Savatiano, Vidiano and Vilana. Red - Agiorghitiko, Kotsifali, Liatiko, Limnio, Mandelaria, Mavrodaphne, Negoska, Vertzami and Xynomavro. Alexakis, Allagiannis, Avantis, Argyros, Biblia Chora, Boutari, Cavino, Creta Olympias, Domaine Hatzimichalis, Domaine Porto Carras, Domaine Sigalas, Estate Raptis, Katogi, Skouras, Katsaros, Kir-Yianni, Lyrarakis, Mediterra, Paraparousis, SantoWines, Skouras, Strofilia, and Voyatzi.